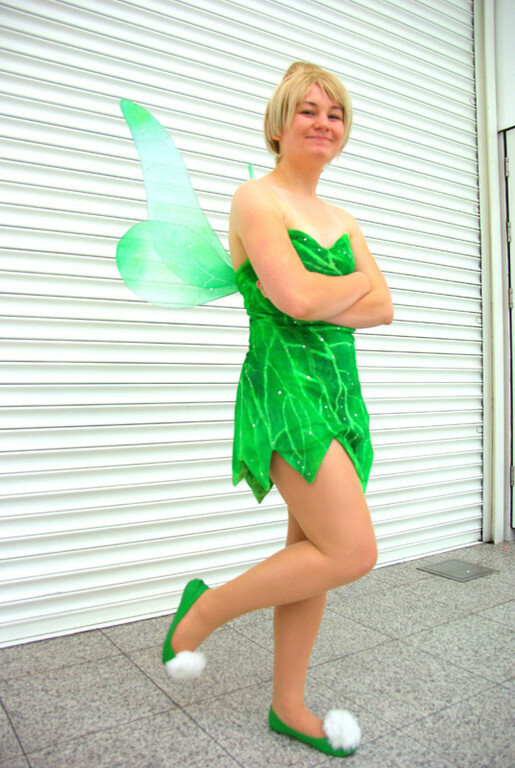 I’d made a Tink costume based on her appearance in Disney’s Peter Pan before, but decided on something different after seeing the new Tinkerbell Movie. My inspiration was the Disney theme park face characters’ costumes. They used such wonderful fabric, that I really wanted to copy the style. However, I didn’t want to stay entirely accurate to the precise design, especially when it’s all so intricate and I didn’t feel capable of copying it well (if I had an airbrush, that might have helped!) I also wanted to take aspects from other references, such as her pointy ears, and blue wings. Mainly, I just wanted to create a leafy effect (like in the movie) and the general idea of the face character design. 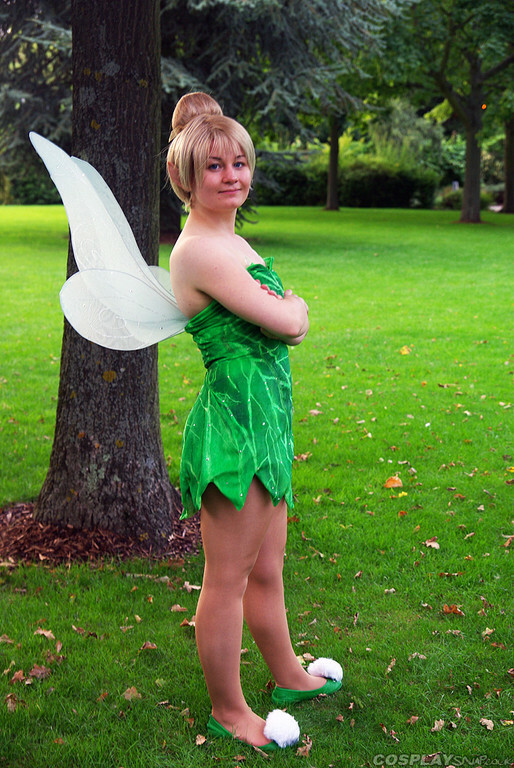 I rushed to finish this costume for AX 2009 when a wee Peter Pan group was proposed, and later took the time to improve it for AyaCon and London Expo in October. Hopefully I can get a full Disney Fairy group together some day! After failing to find any leafy or mottled fabric to save me some work, I settled on a plain green fabric and decided to detail it and colour it myself. 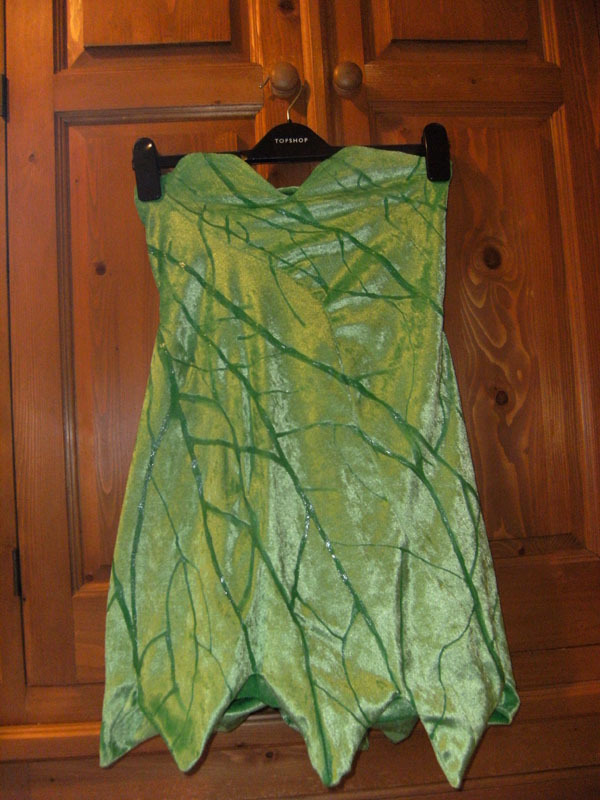 I chose a horrific green stretch crushed velveteen for the dress, because it was cheap and the right sort of colour and texture I was going for. Since I would later be painting it, I hoped that would reduce the horror. My pattern was made from scratch, working with spare stretch fabric as a mock-up. I made a basic dress with just side seams, then doodled all over the mock to mark out the curved seams I wanted, the neckline and zigzag hem, then chopped it up to use as my final pattern. It took several tries to get it right and was decidedly not easy fitting it correctly with the curved panels. The completed dress is fully lined to deal with the zigzag hem, and due to the stretch fabric, it just pulls on and off. Initially I used clear straps, primarily to support the wings, but I later found a more secure way to wear the wings, so could leave everything strapless. It doesn’t stay up perfectly, being just a stretchy dress, but it’s worth the awkwardness to avoid straps! I put bendy wire in the hem around the sweetheart neckline which keeps it all safely in place. With my dress finished, I was able to work on the fabric to have it match the designs. I used a simplified batik method, drawing out the leaf veins in tacky glue, then painting the dress darker in a couple of shades of acrylic spray paint. The glue scraped off after being soaked in water, and the paint mostly didn’t, leaving behind the veins in a paler shade. 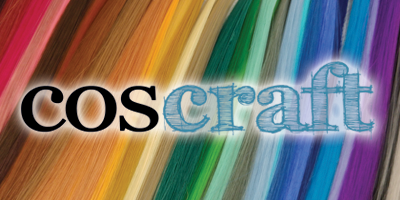 I think the lines could be better and my final colour paler, but I’m still very happy with the effect. I’m glad I made the lines quite thick, since they photograph clearly. Finally, I glued on loads of rhinestones, as on the wings. As an amusing addition, I pinned bells to the inside of the dress around the hem, so I could jingle wherever I went! 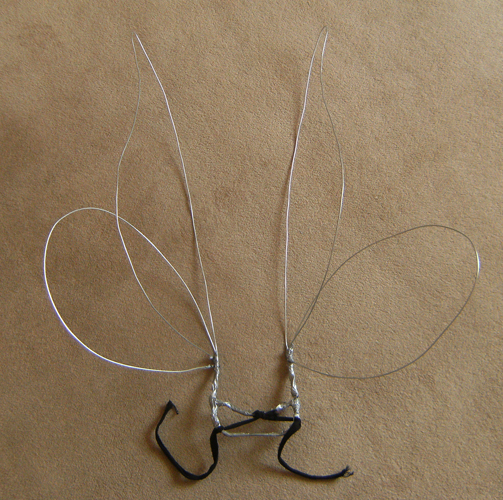 My wings are made from 2mm steel wire, which I bent to form the outline. For AX, I used the idea here for attachment - having wire prongs which slot into channels sewn to the lining of my dress. Although it’s a nice secure attachment method, unfortunately, as the dress itself isn’t capable of supporting much, I still needed straps to hold everything up. For my second set of wings, I used my strapless bra (lol) to secure the wings along with an elastic strap around my torso, which avoided shoulder straps. 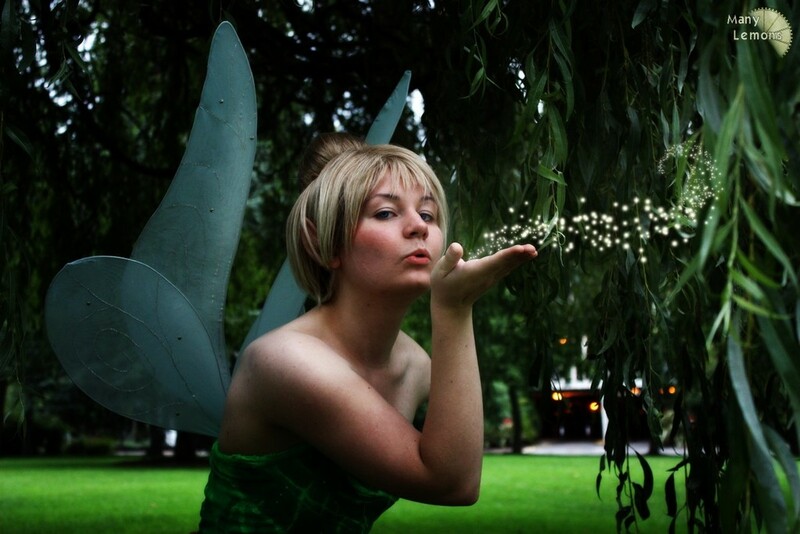 My first set of wings were covered in organza, but I found it very hard to get it neat on the larger wing shape. I decided to remake them, and hit upon stretching tights over the wire frame. I got hold of sheer pale blue tights which were perfect, and this method is idiot-proof enough for even me to get it neat! The swirl patterns were drawn on with glitter glue, on both sides of the wings, and I also glued on the same rhinestones like on the dress. 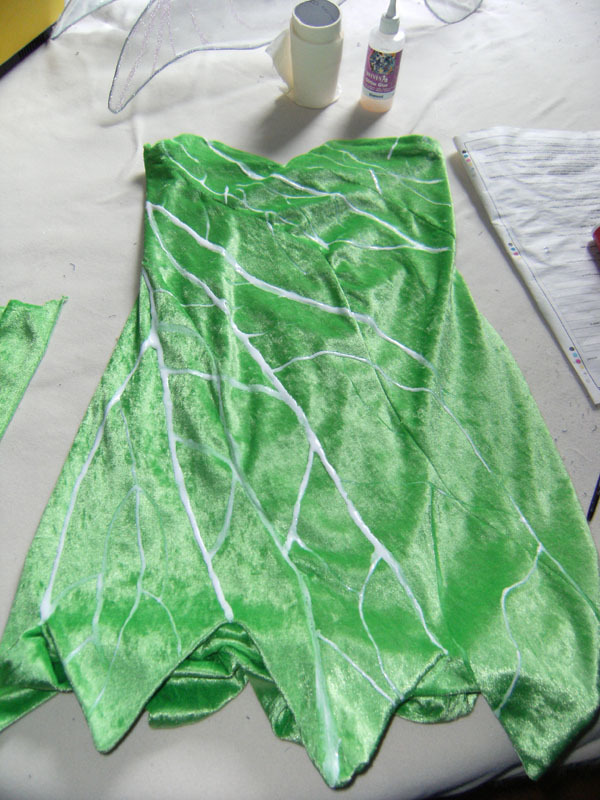 I later used watered down fabric paint to spray on a green gradient, like the park costumes have. The paint was actually left over from my experiments in choosing a paint to spray the dress, so it was good to find a use for it. I really like how my wig turned out, and it was also very easy style. I bought two identical short wigs cheaply from this eBay seller. One was the base, the other was used for the bun. Buying two wigs ensured the colours matched, handily meant everything was all conveniently wefted for me, rather than dealing with loose extensions. The base wig was parted, had the fringe cut in and was trimmed to suit. I decided to wear the pointy ears from Hightower Crafts which I originally bought for my Peter Pan costume, and cut the wig to ensure it somewhat covers the join on my ears. For the bun, I initially hacked up a styrofoam ball to the right size and hollowed it out. I then wrapped the second wig around it, hairsprayed it in place, and sewed it to the base wig using a curved needle. Some organza ribbon completes it. I later redid the bun to alter its shape and size, this time wrapping the wig around a cylinder of cardboard, and safety pinning it in position. The pins mean it's easy to revisit it and tidy it up as required, or wear the base wig on its own without the bun. The shoes are ballet flats from Primark, which had their leathery surface sanded off (never again) then were painted with acrylic to match the dress. I couldn’t find pompoms large enough, and didn’t want to make my own from wool, so I ended up using fur fabric, which turned out ok. Thanks! That photo’s only partially shopped; it's a perspective shot! Ah, really? XD That's just more amazing! Tricked my eyes! So cute. Love the wig and the wigs. The dress looks ace as well. Love the photos too. eeeee so adourable!!! <3 <3 <3 You look beautifuls! Brianna Garcia reference picture! 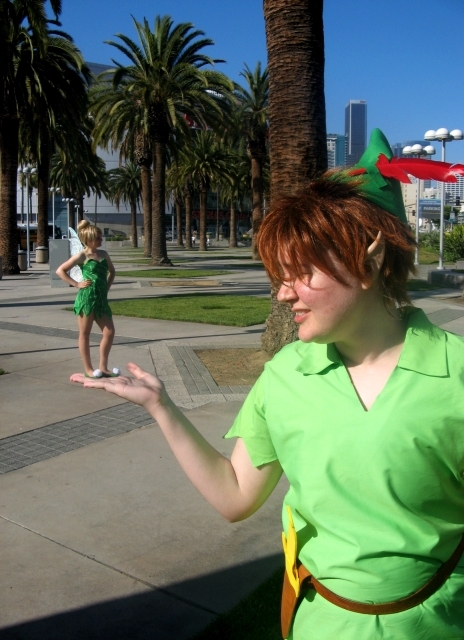 8D Brilliant cosplay! I love the dress! Yup! We met her on our recent trip to Disneyland ^_^ Was kind of awesome to be able to ask permission to use her photos in person! adorable! I dunno how to say, but you have just the right look for her. 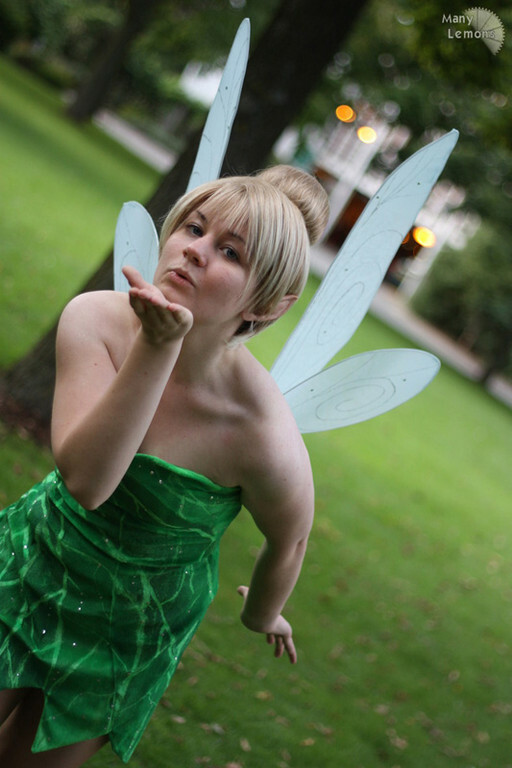 Your Tink is fantastic, you look really pretty! 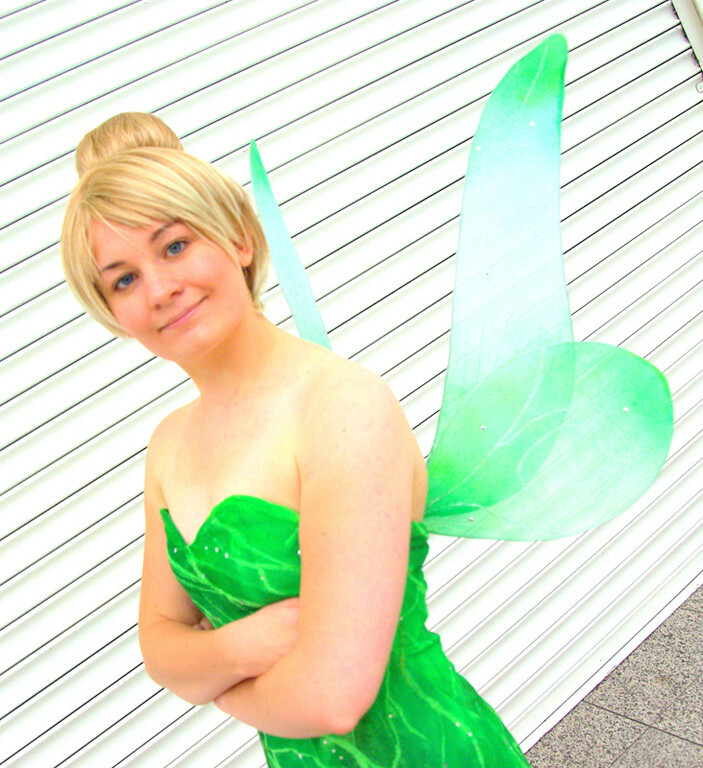 Such a lovely Tink! The wig strangely suits you, but more importantly I love the details you got on the dress and it's really interesting how you got the effect. ...okay I'm making Eli do all my post processing from now on XD I was going to try and redo the 3d one with sparkles but haven't managed it yet Thanks for once again being my guinea pig with the new lens! I am glad I caught you in time ;) And yes, those wings are indeed made of magic and gravity defiance. It was great to see this costume up close! The detail is amazing! <3 You look great! Here’s the basic wing frame before I covered it. I used a more flexible wire to wrap round and connect the thicker wire, and also duct taped around it a lot, as you can see, which also protected any sharp ends. I made newspaper patterns for the wing shapes, which let me test out the shape and size (ensuring the final wings would fit in my suitcase!) then I bent the wire to match the pattern pieces. The patterns were also helpful for getting both wings to match, and they also had the vein designs drawn on, which let me trace them on to the wings and have each wing end up identical. I used silver glitter glue for this. The important bit is that U-shaped connector. That’s the bit that slots down the back of my dress (and bra) and stabilises the wings too. The band of my strapless bra is what’s supporting the wings and holding them up, but the black elastic strap in the picture also ties around my torso, and stops the wings shifting from side-to-side at all. I later covered that U shape in felt to pad it out and make sure it would be comfy against my skin. To complete the wings, I got 2 pairs of sheer coloured tights, and stretched them over the wing frame. The disadvantage of this technique is that the tights limited the width I could make the wings, as they would only stretch so far. Where the wings are narrower than the tights at the tips, I hand sewed a seam and chopped off the excess fabric (also sealing the edges with clear nail polish in case they ran) then turned the tights the other way out to leave the seam on the inside. With the seam resting along the wire, it’s not very obvious when viewing the wing from either side. For my first wings, I tried using organza to cover them. I think with more patience and practice I could have got it neater, but when covering the large wing segment, it was very difficult to keep a piece of organza that size taunt, so it’s perhaps also that the nature of the wings made them more awkward to cover. I certainly didn’t have the same problem covering the small sections. The tights worked out nicely and were suitably idiot-proof for me, so I’m pleased with my new wings! Next was spray paint time, as in, the poor person’s airbrush. 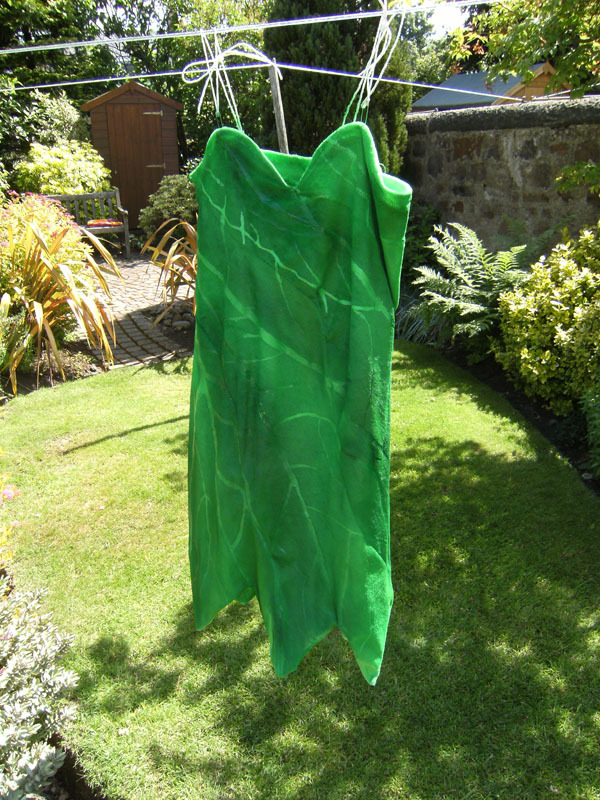 I got a couple of shades of paint, and went nuts in the back garden, aiming for a spirally effect with the two colours, roughly following the curved panels of the dress. Every bit of fabric had to be covered, otherwise the glue-veins I’d drawn wouldn’t have a darker background to show up against. The dress has safety pins in the lining and string tied to them to suspend it over the washing line. I was ensuring every area of the dress was free to be coated in paint! When dry, the glue scraped off after being soaked in water, with the aid of a kitchen knife and my nails (which turned very green). The spray paint mostly stayed in place, as intended, but the scraping also softened up the paint and freed the pile of the velveteen again, it’s not all stiff and nasty with the paint. I’m pleased with the result, since it’s still quite velvety, but no longer so horribly shiny! I really like how it looked when it dried. If the base fabric wasn’t so nasty, I might have stopped at this point! 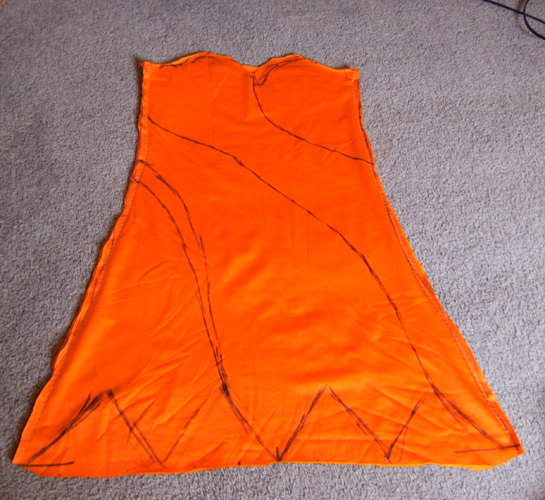 It was quite hard to do the lines as I could only do the front of the dress, wait for it to dry, then do the back. In reality, the designs wrap right round the dress, following the curved panels, so a line I was drawing would start on the front, but end up on the back. That meant it wasn’t ideal to do it in front/back sections. 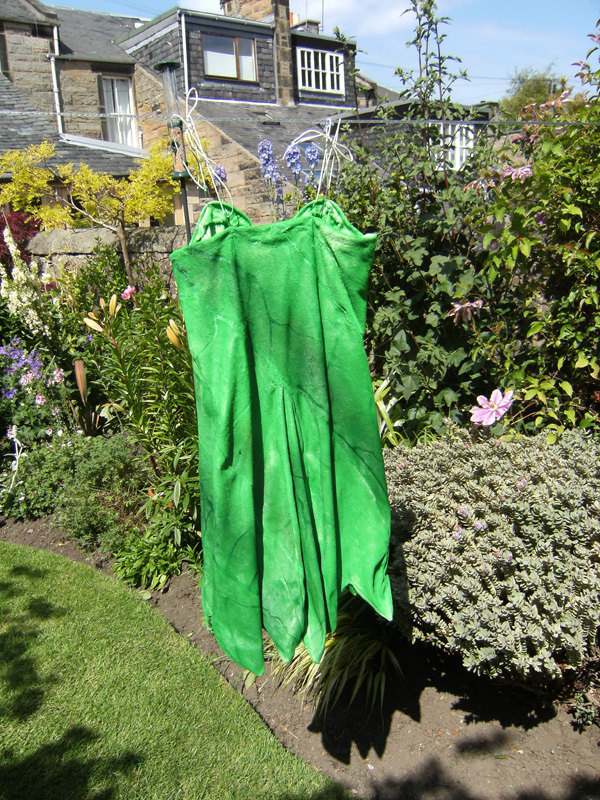 Result: horrible shiny green dress (if you look closely, you can see the curved seams). And I made it even prettier by dribbling glue all over it. This was my cheat’s batik method. More sensibly, I could have painted the dress, then painted the veins on afterwards in a paler colour. But I liked the sound of this technique, and the colour of fabric I had was perfect for the veins. I also dislike painting since I’m useless at getting it neat, and drawing with a glue bottle nozzle was definitely easier for me! I did a few swatch tests in several glues, then when they were dry, also tested out a few different paints over the glue doodles (originally I was hoping I could make my own spray paint by using fabric paint and water in a spray bottle, but it turned out too dilute). Then the real test was how well the various glues and paints would hold up when washed and the glue removed. The idea was to have the paint stick, and the glue wash out, leaving the vein designs in a paler shade. What ended up working best was tacky glue, and acrylic paint. So this photo is the leaf veins drawn out in the tacky glue. I mostly followed references for the lines, but not entirely since it seemed pointless to be so accurate. I also didn’t have many photos showing the back! I made the lines quite thick, so they photograph well. When I finally got a reasonable fit, the pieces for the dress and its lining could be cut out of the velveteen with seam allowance added, and sewn along all those fiddly curved seams with my sewing machine’s overlocking stitch, which helpfully finished the edges quite well as I went along. The velveteen loved to shed everywhere and practically dissolve where cut. My lining was identical. I wasn’t too sure about having the fuzzy velveteen facing against my skin, but I decided I’d better have the lining the same since it would show on the interior of the zigzags. With things satisfactorily doodled out (I fail so hard at proper sewing, don’t I?) 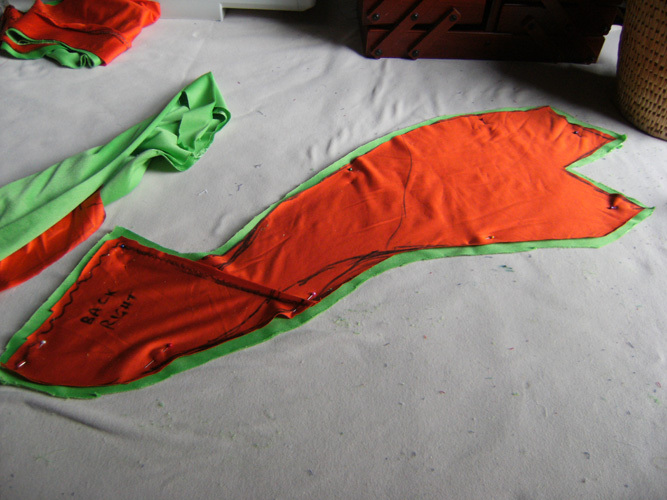 I could cut apart the mock-up along the new seam lines, and that gave me a pattern for the real deal. I was careful to test my pattern - actually making a mock-up dress in more spare fabric, using the curved pattern pieces I’d created. 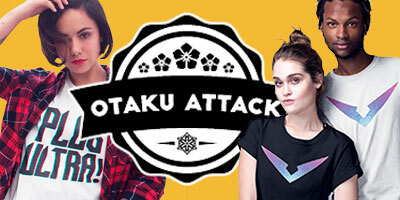 Just as well I did this, since I had to go through a few more mock-ups to adjust the pattern. As pretty as those curved panels are, in practice they were just a nuisance! It was very hard to adjust the fit of mock-ups with those curved seams. It’s all very well determining that it needs to be taken in at the waist, but a lot hard to do when the seams are all over the place. So this is retrospective, but seeing as I have the progress photos, I might as well upload them to document it all. Step 1 was my mock-up. The final fabric for the dress is a horrific stretch velveteen, so I needed to make the mock-up stretchy too. At least it’s easy to fit stretch fabrics. 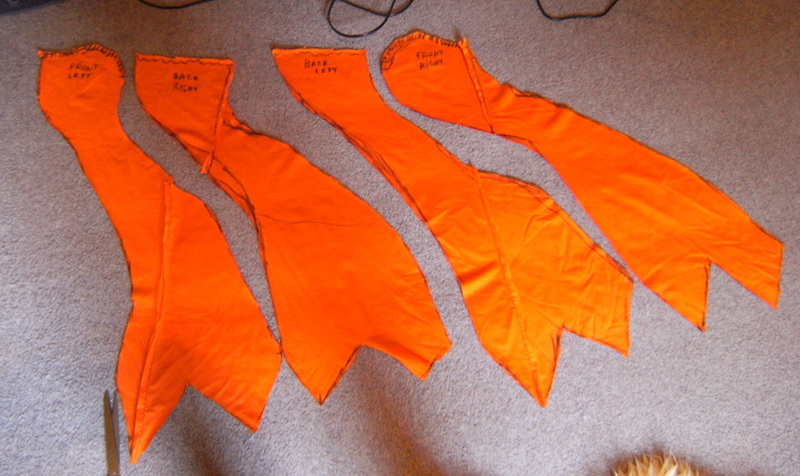 I had a heap of spare orange lycra, for which there are limited uses, so it went into this pattern-making exercise. I made a simple tube dress to fit me, which just had side seams. I then cut in the sweetheart neckline and zigzag hem, but most importantly, marked (with some trial and error) where I wanted the new seams to go. The face characters’ dresses are made up of curved panels, which I really liked (determining their existence involved lots of examining of high-res photos on Flickr! ), and I also thought they’d be helpful because I could later follow the seam lines to mark out my leaf vein designs.